For my Whimsy card this week, I pulled out the just-released Farmhouse Wreaths again. I made a striped background using green and yellow alcohol inks, and adhered it to a white base. I stamped Farmhouse Fabric on a kraft piece, tied some twine around it, and adhered it to my base. I stamped the twig wreath in green, colored it, and used a circle die to cut it out. I added the sentiment in black, and went over the berries on the wreath with diamonds stickles. After it dried, I mounted it to the card base with foam tape. 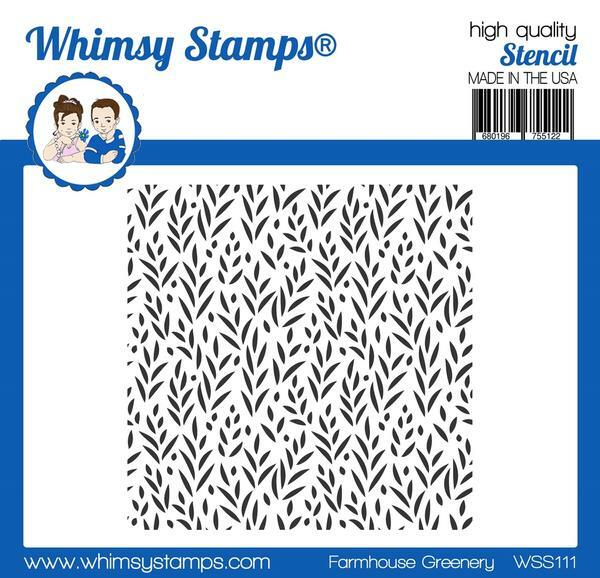 Hello, thanks for stopping by as we begin the Whimsy Stamps March release! All products are available for purchase now, so you don't have to wait to purchase what you like! There will be inspiration all week on the Whimsy blog. 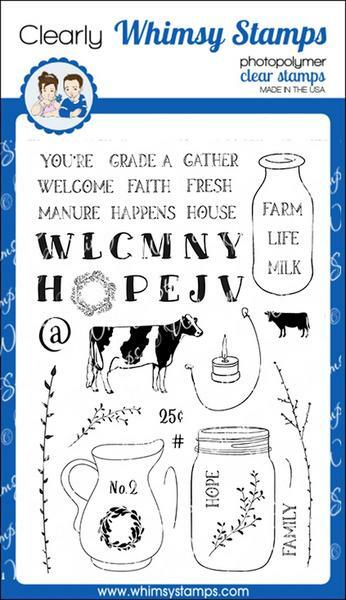 We are starting with all farmhouse-themed products today! 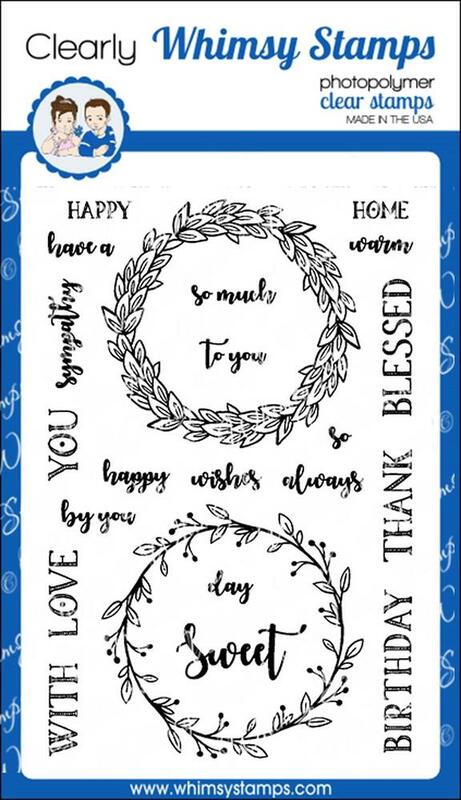 My first card uses Farmhouse Vases stamps, Farmhouse Fabric background stamp, and Straight Edgers die set. I stamped, colored, and cut out three milk bottles, then white embossed different images on them when they were dry. I took a white panel and die cut the bottom edge with the ric rac edge from Straight Edgers. 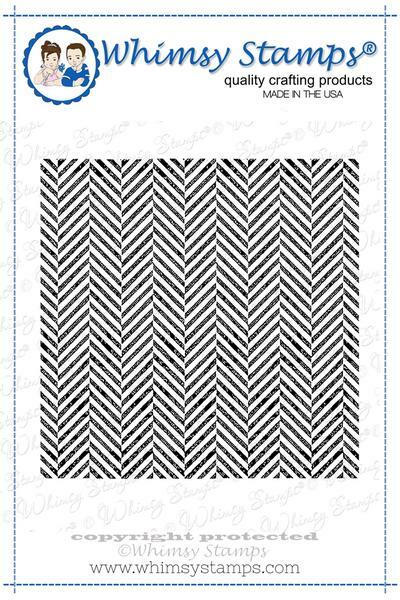 (There are four dies in this set and each one cuts two different edges for a total of eight edges.) I put a piece of chocolate cardstock above the ric rac to act as a shelf, and placed my milk bottles on them and did a little masking to stamp the sprigs. I tied some blue thread around my main panel. The kraft base is stamped with Farmhouse Fabric, a new rubber background. I popped up my main panel on the kraft base. For my second card, I combined Farmhouse Wreaths and Farmhouse Greenery stencil. I started this card by sponging a kraft base with the Farmhouse Greenery stencil. I cut out the shaker panel from Sweetest Birthday Shaker Builder and sponged it with the same ink to make it stand out against the background. Next, I stamped, colored, and cut out the wreath. I added crystal effects to the leaves and let it dry. When I came back, I added the sentiment and the Blessed (included in the set) on a banner. I added some twine behind my wreath, popped it up on my card base, and added some Christmas Cheer enamel dots to finish it up. Since I've been a slacker lately with my cardmaking, I'm working on making it up. So I have TWO cards to show you today, both made with You're My Favorite, by Whimsy Stamps. 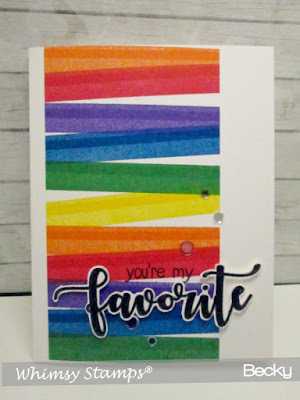 I stamped a whole panel in rainbow stripes using two stamps from Get In Line. 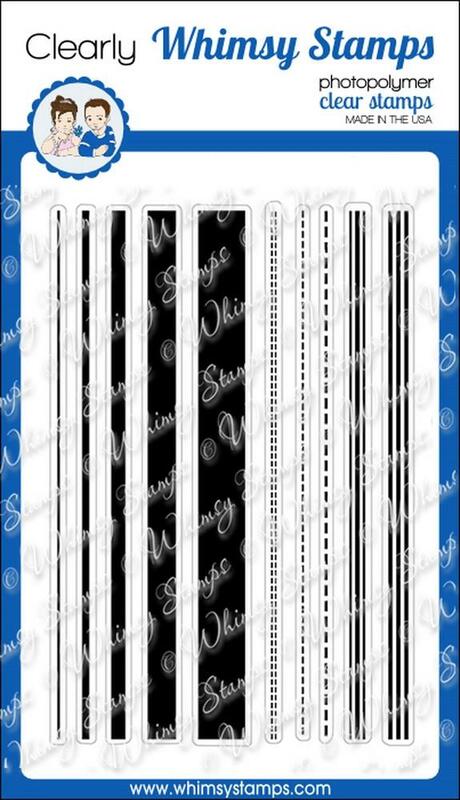 I first stamped the wide stripes all the way down, let it dry for a minute, then stamped a thinner stripe right on top in the same colors. 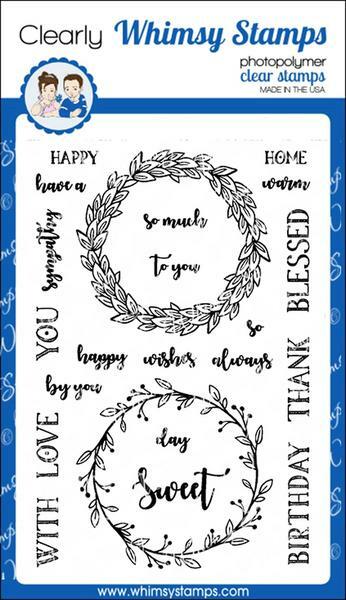 I trimmed off the part I wanted to use on this card and kept the other piece to use on a later card. I stamped the "favorite" (from You're My Favorite), cut it out and put foam tape on the back. I attached the rainbow panel to a white card base, stamped "you're my" on it, added my previously-made "favorite", and put some clear sequins. Lastly, I went right over the black ink on "favorite" with crystal effects for some shine and more dimension. I cut a white panel and stamped all the BESTs (in orange, eggplant, and gray), added the rest of the sentiment in black, and adhered some clear sparkly large dots. I cut out an eggplant flag and attached it. I really wanted to staple it on, but I can't find my stapler!!!! I popped up the whole white panel on a gray card base and called it done. Today I get to show you Gnome Sweet Gnome for day four of the Whimsy February Release! I colored up this cute little guy and cut him out. I then created the background and stamped the sentiment. I popped up the main panel on a green base, then added my gnome. I covered his hat with gloss lastly. Thanks for stopping by, head over to the Whimsy blog to see what's there! 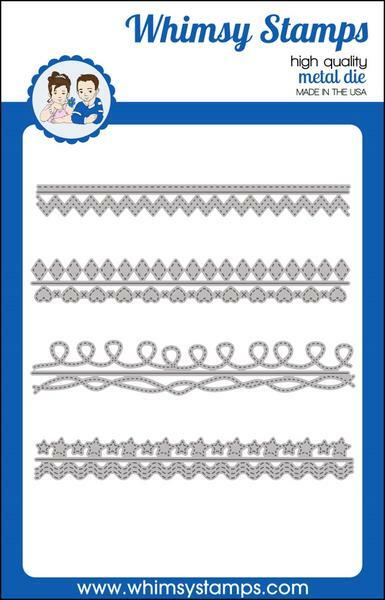 The February Whimsy Stamps release has begun, and today begins peeks of the clear stamps and stencils! All new releases are now available for purchase in the Whimsy store. 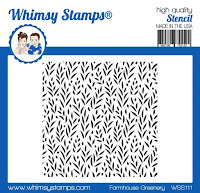 Today I am showing you the Star Galaxy stencil and You're My Favorite stamp set. I used the Star Galaxy stencil as an impression plate to make a background of stars as you can see below. 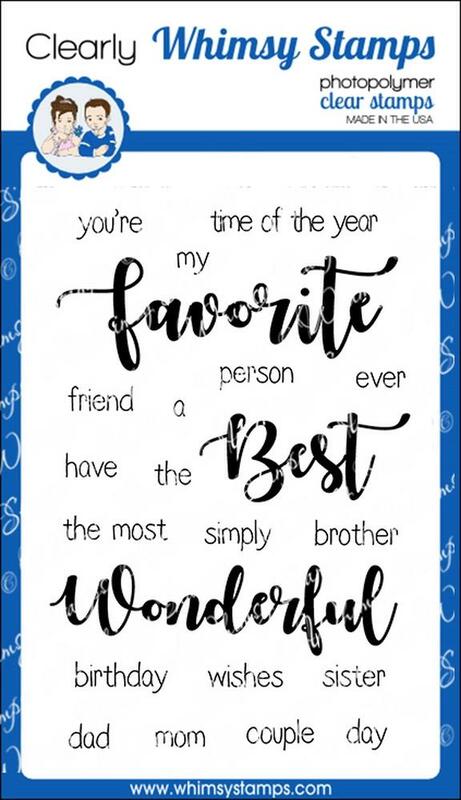 I stamped "wonderful" in black ink, fussy-cut it out, and went over the script with crystal effects to add some shine and dimension. Elegant Gifts is the newest Customer Appreciation Set that you can earn free with a qualifying order. Click HERE for all the details. I stamped three gifts in different colors and added silver sparkly bows/ribbons to them. The background on the base is Lattice Background. I stamped the sentiment and swirls (included in the set) on a white panel, adhered the gifts, and popped up the panel on the base. I made this "Love You" card for my Whimsy Stamps card this week. I die cut the large heart from Sketched Elephants dies and stamped it with the dot strip from Polka Dot Fun. I cut "Love" from Cardbuilder - Hearts of Love, and then covered it with versamark and clear embossed it twice. This is a technique I saw Jennifer McGuire use, and it gives you a darker, glossy look. The "Love" and the pink rectangle (Handstitched Rectangles) in the back are actually the same cardstock, but clear embossing the word made it darker. Cool! I started assembling my layers, adhering the heart to the rectangle layer, then adding my words (the script you is Brush Script Lower Alphabet dies) and tying a twine bow around it before popping up all the layers on a kraft base.